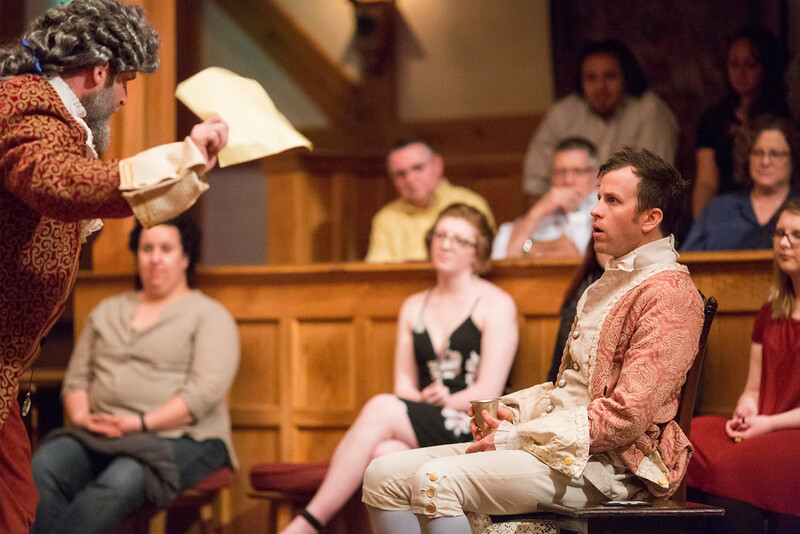 In William Congreve’s witty farce, love and money square off as two brothers attempt to follow their hearts without losing their inheritance. 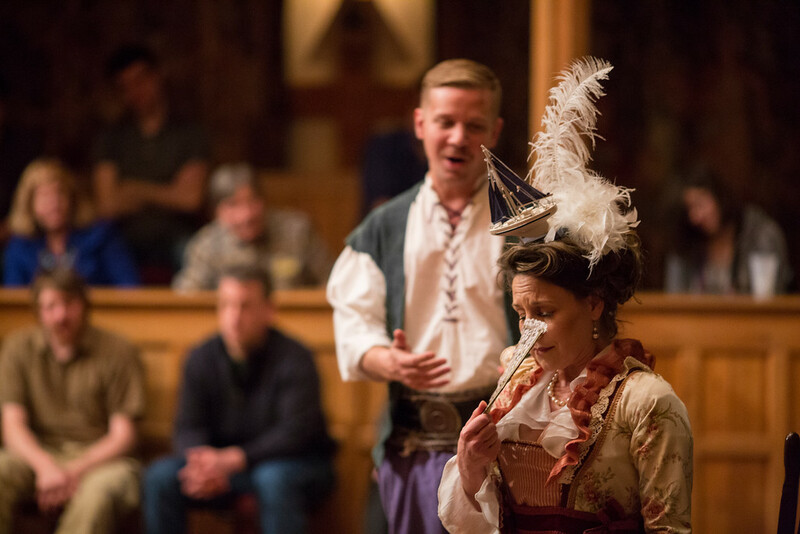 Populated by a lover named Valentine; his clever beloved, Angelica; a less-than-virtuous Miss Frail; and a braggart, Tattle, Love for Love takes a satirical and sardonic look into Restoration-era romance. René Thornton, Jr. in LOVE FOR LOVE. Photo by LINDSEY WALTERS. 2016. Patrick Midgley and Aidan O'Reilly in LOVE FOR LOVE. Photo by LINDSEY WALTERS. 2016. 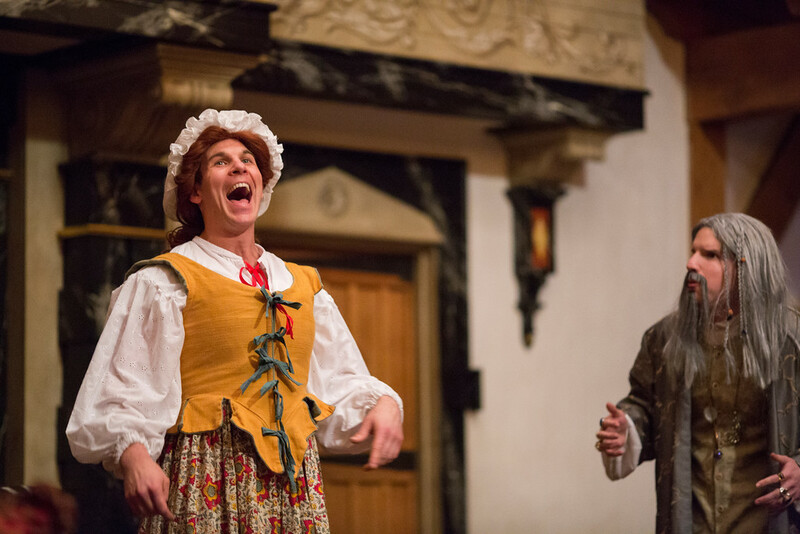 Jonathan Holtzman and Chris Johnston in LOVE FOR LOVE. Photo by LINDSEY WALTERS. 2016. Ginna Hoben and Allison Glenzer in LOVE FOR LOVE. Photo by LINDSEY WALTERS. 2016. Lauren Ballard and John Harrell in LOVE FOR LOVE. Photo by LINDSEY WALTERS. 2016. Chris Johnston and Lexie Braverman in LOVE FOR LOVE. Photo by LINDSEY WALTERS. 2016. Aidan O'Reilly and Patrick Midgley in LOVE FOR LOVE. Photo by LINDSEY WALTERS. 2016. Benjamin Reed and Ginna Hoben in LOVE FOR LOVE. Photo by LINDSEY WALTERS. 2016. Lexie Braverman and Jonathan Holtzman in LOVE FOR LOVE. Photo by LINDSEY WALTERS. 2016. The cast of LOVE FOR LOVE. Photo by LINDSEY WALTERS. 2016. Valentine Legend, a young gentleman, has squandered his money by living an irresponsible and riotous life. Deeply in debt and practically destitute, Valentine must take desperate measures to hold on to his beloved Angelica, resorting to blackmailing one of his creditors. Valentine’s father, Sir Sampson Legend, reveals his plans to get Valentine out of debt, only if Valentine agrees to sign away his rights as Sir Sampson’s heir to Ben Legend, Valentine’s younger brother who is currently at sea. Meanwhile, Foresight, an old fool a little too invested in astrology, brings his unsophisticated daughter, Prue, in from the country and plans to marry her to Ben. Angelica teases her uncle, Foresight, for his reliance on astrology, angering him and causing him to threaten her relationship with Valentine. 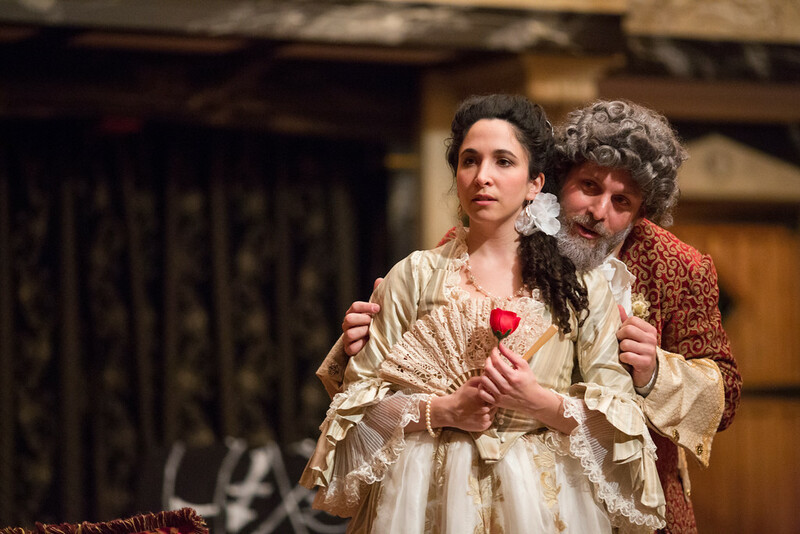 Angelica, nettled, leads Foresight to believe that his beautiful young wife has not been faithful to him. Sir Sampson agrees with Foresight to Ben and Prue’s marriage, which is almost broken when Sir Sampson also jokingly hints that Foresight’s wife isn’t true to him. The two make amends. Valentine, seeking Angelica, finds his father at Foresight’s house. 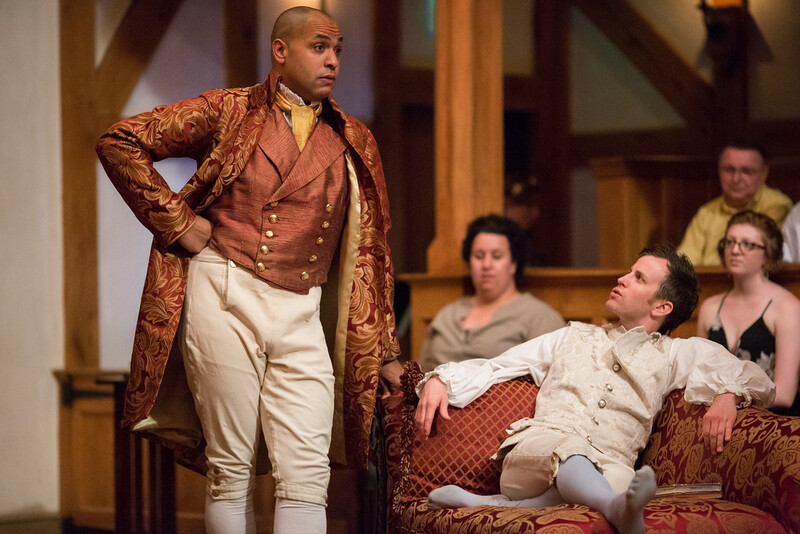 Sir Sampson disowns him as a son while Valentine tries to get him to change his mind about the conditions of their deal. 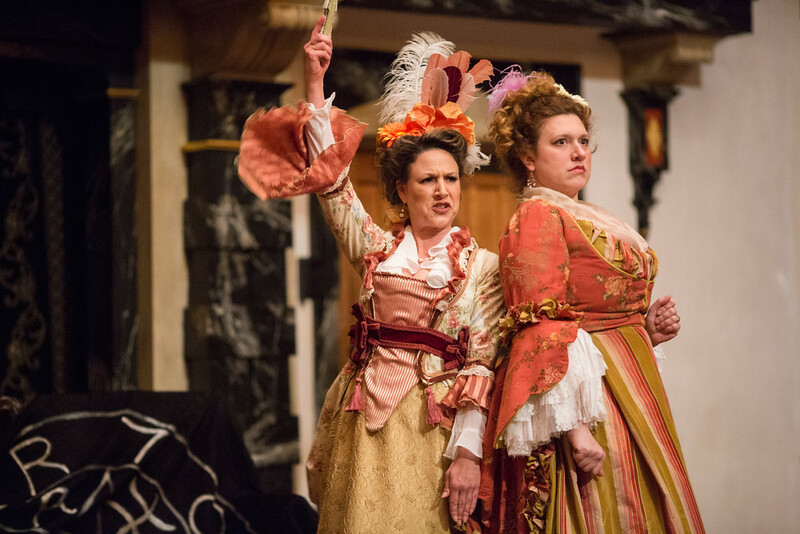 Mrs. Foresight and Mistress Frail, sisters, argue over their individual indiscretions; Mistress Frail announces her intent to marry Ben and enlists her sister in the endeavor. In the meantime, Prue finds herself charmed by an acquaintance of Valentine, Tattle, though he quickly grows bored with the unrefined country girl. 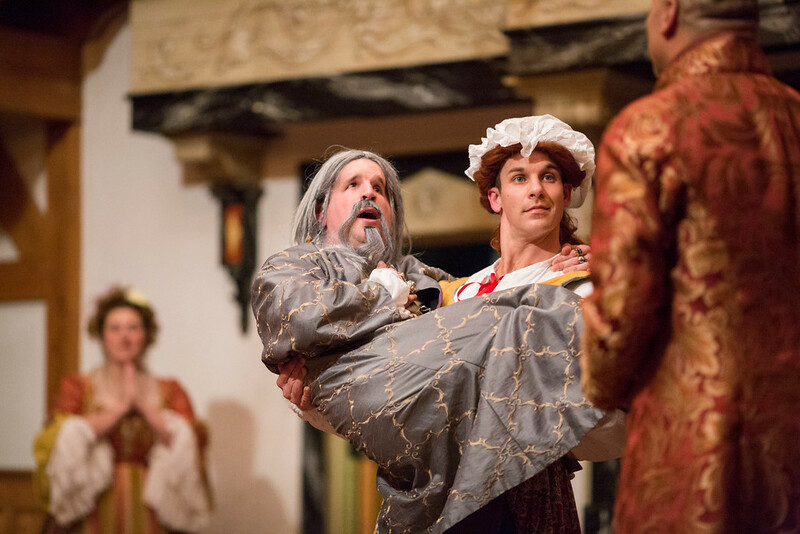 Ben returns from his voyage and declares his disinterest in marriage, though the charming Mistress Frail quickly changes his mind about taking a wife. When he meets his intended, Prue, the two do not get along. 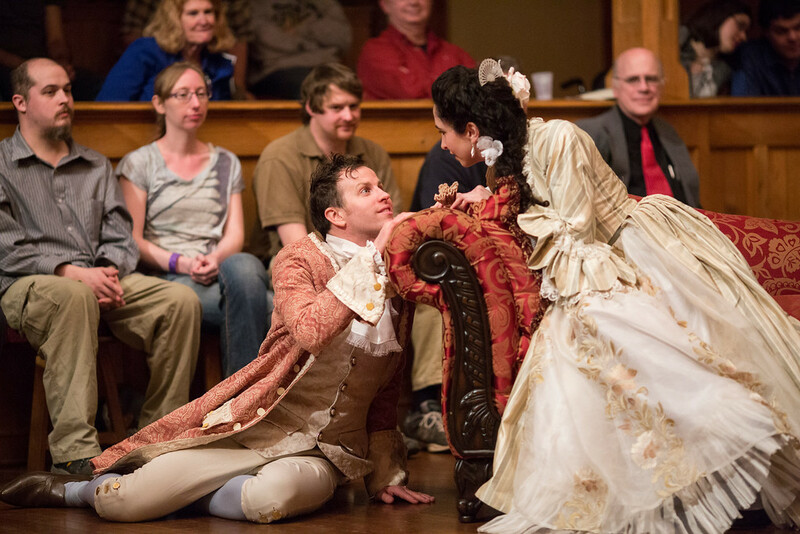 Scandal, another friend of Valentine, manages to convince Foresight that Valentine should not sign over his inheritance. Then, to suit his own fancy, Scandal hoodwinks Foresight too so he can flirt with Mrs. Foresight. Soon after, Ben and Mistress Frail declare their love and intend to marry. Broken engagements, fake weddings, pretend lunacy, and revelations ensue. The “tennis court” theatre in Lincoln’s Inn Fields. William Congreve (1670-1729), whose father was a Cavalier, ran in important literary circles. He was a friend of the satirist Jonathan Swift and a disciple of the poet and playwright John Dryden. From the age of 23 to 30 he wrote five plays, including this play, his most popular, and The Way of the World, the great English example of the Comedy of Manners. His early success and his good conversation won him the favor of people in high society, most of them women, that got him comfortably through the second half of his life. Like many of the men who wrote Restoration comedies, Congreve had an ear like Shakespeare’s for the well-turned phrase; and his leading ladies, particularly Angelica in this play and Millamant in The Way of the World, have a depth to them reminiscent of Shakespeare’s heroines. 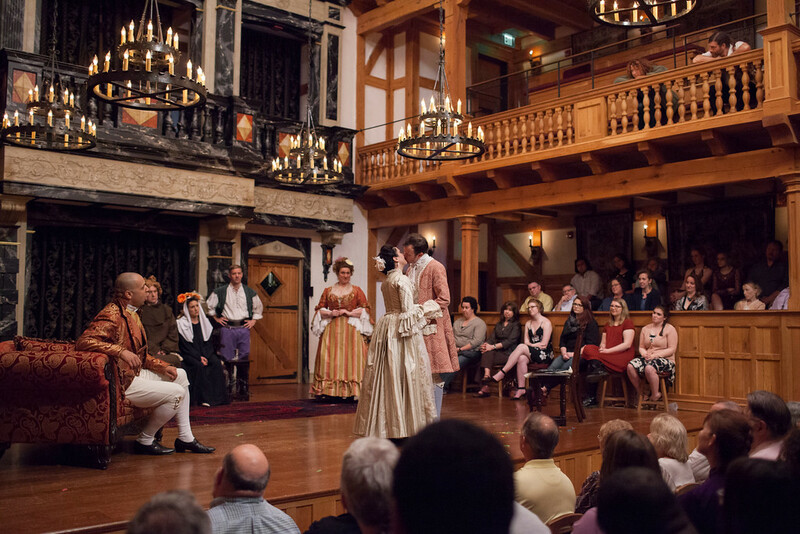 Unlike Shakespeare and Shakespeare’s contemporaries, Congreve and his fellow Restoration playwrights worked on a smaller comic canvas, mostly the romantic relations of wealthy people in high society and their hangers on. Any semblance of the outside world and its pressures barely intrudes on these indoor dramas. They enjoy it but give it less attention than Congreve’s Way of the World. Not today and not for this play in particular, but social critics of the time (notably Jeremy Collier) lumped Congreve’s work in other Restoration comedies and condemned them for their sexual innuendo and their lack of moral value. Sir Sampson Legend. ’Nuff said. 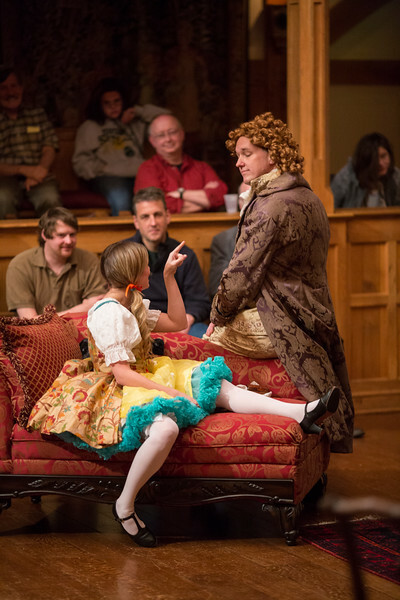 The scene between Miss Prue and Tattle is a delightful satire on the rules of courtship. Supple and delightful. You’ll hear so many delicious phrases, you’ll want to buy the script (which is available in our shop).